Fordern Sie das Programm mit Veranstaltungen und Ausstellungen an, damit Sie nichts verpassen! von Tuesday 09 10 2018 bis Wednesday 15 05 2019 Painting exhibition and sale, "Montain story". Acrylic modern paintings - watercolors - drawings. von Friday 07 12 2018 bis Friday 31 05 2019 Exhibition of Prints: saving size, intaglio (intaglio engraving on copper) and lithography (drawing on stone). von Saturday 08 12 2018 bis Monday 30 09 2019 oil paintings with spatulas. subjects: the valley of Chamonix and its summits. von Saturday 08 12 2018 bis Sunday 05 05 2019 Alexandre Galperine, dear friend to the Carrier family. Discovery of a painter passionate about the Chamonix Valley, who wanted to dedicate his exhibition to Jean-Pierre Devouassoux, who was one of the emblematic guides of Argentière. von Tuesday 11 12 2018 bis Sunday 15 09 2019 An exhibition on the theme of the Great War "14-18". It presents the historical context of the first war and honors the natives of Servoz, who died for France. von Saturday 22 12 2018 bis Sunday 19 05 2019 This exhibition was created to celebrate the 50th anniversary of the local heritage association " Les Amis du Vieux Chamonix". von Monday 01 04 2019 bis Monday 27 05 2019 "Soleil de glace" is an exhibition on Alpine fauna by wildlife photographer and filmmaker Guillaume Collombet. His photography is characterized by intense backlighting and pristine, snow covered landscapes. 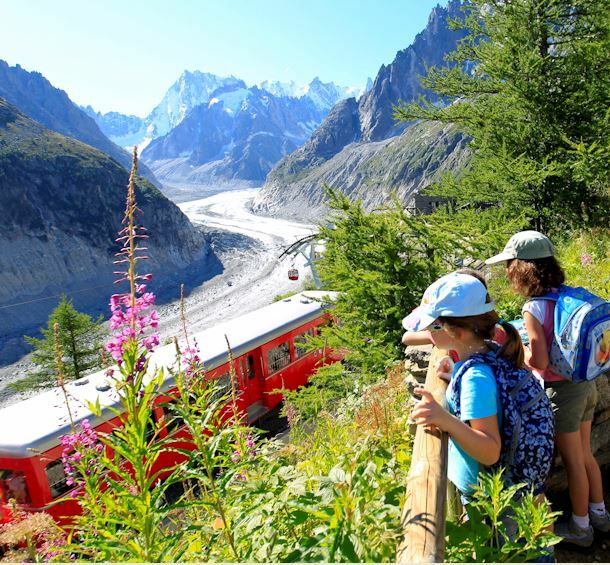 von Saturday 06 04 2019 bis Sunday 05 05 2019 The Alpin Museum proposes to you to discover the historical and artistic patrimony of the territory of Mont Blanc. von Saturday 06 04 2019 bis Sunday 05 05 2019 Set up to celebrate its 40th anniversary, this exhibition is the chance to find out about the High Mountain Military Group (GMHM), from its creation in 1976 to its current day missions. von Saturday 06 04 2019 bis Sunday 05 05 2019 Aside from his work as a baker and pastry maker, the trade he learnt from his father, Pascal Guiguet-Bologne has devoted all of his free time over the past 40 years to the search for minerals around his hometown, Bourg d'Oisans (Isère). von Monday 15 04 2019 bis Monday 22 04 2019 Win €100 worth of casino gaming tickets and other prizes by guessing the correct number of chocolates! von Thursday 18 04 2019 bis Sunday 21 04 2019 Annual gathering of Decorative Painters. 75 artists from 15 countries. Exhibition, demos and lectures. Specialties represented: fresco, trompe l’œil, ornamentation, street art, faux wood and marble, gilding, calligraphy. von Friday 26 04 2019 bis Sunday 28 04 2019 Musilac & Chamonix-Mont-Blanc have joined forces to create a new Pop-Rock festival in the most exceptional location! von Saturday 27 04 2019 bis Sunday 28 04 2019 Marc-Henri Mialon, head sommelier of the Albert 1er gastronomic restaurant, wishes to share his passion for wine with you. He organizes monthly wine tastings and gastronomic lunches in the company of one or several winemakers. von Friday 24 05 2019 bis Sunday 20 10 2019 The Hameau Albert 1er is pleased to show you Tristan Vyskoc’s artworks, painter and runner. Although descended from a painter grandfather (René-Marie Castaing), this artist would have not believed to become a painter himself.